Seems simple, right? You go into a bank (or find one online) and send them all your “stuff”. They write you a pre-approval letter with the amount they can loan you. Then you go shopping. Sounds easy, right? Well, not always. We have seen many buyers get lured into an enticing % rate (usually online). Most likely nobody has heard of the bank, or it’s a bank from out of state, or the rate is for someone with perfect credit and putting 50% down. These lenders are quick to send you the pre-approval letter, but when you need them, will they answer their phone? Will they send a local appraiser out in a timely matter? Will they close on time? Will the deal fall thru? If you’re not able to easily get them on the phone or able to walk into their office, chances are it will be difficult to deal with issues that pop up (big or small). We recommend looking for a local lender who can sit down with you and have a conversation about the process. A good lender can educate you about all the different loan products (which changes frequently). They can show you a timeline of how and when everything is going to happen. Just like your Realtor, make sure you have an experienced & trusted lender partner. Someone who is going to be proactive. 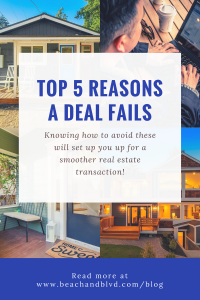 In a multiple offer situation, a good lender will call the listing agent to let them know that you are financially secure and not a risky choice. Ask us about our preferred lenders, and we’ll get you headed in the right direction from the very start! We were recently at a party and we spoke to a guy who said he put in 45 offers and was outbid every time – eventually he decided to buy new construction. Wow, 45 offers?! He admitted they went $50K – $100K above the asking price. Seems reasonable, right? Well, apparently not. In great neighborhoods, the entry-level priced homes are SUPER desirable! $50K – $100K over ask is just not enough. This is an example of unrealistic expectations. Figure out what’s important to you, size of house, neighborhood, school, commute, and what your Must-Have’s are. If you want to be in a hot neighborhood, you have to adjust your budget and/or features. If you want to stay in a budget, you may need to consider a different neighborhood further outside the city, a fixer-upper, new construction, or finding something off-market. These are difficult conversations, but they need to be discussed up front, so it doesn’t take 45 tries before shifting gears. Thinking about Buying or Selling? Let’s schedule a consultation and start with a clear vision. In a tech-savvy world, relationships still matter!! An agent can’t survive hiding behind their computer. It’s so important for Real Estate agents to build relationships with other agents. Having a friendly rapport with an agent on the other end of a deal is key. When we show a home that our client is interested in, we call the listing agent immediately to find out more information and let them know we have a client who may be interested in the property. As the timeline moves on, we keep in constant contact. When they receive our offer, they know us, they know you, and they feel confident that this is a “real” offer and worth considering. When we’re on the listing side and an offer comes in from an agent we don’t know, haven’t heard from, don’t know anything about the buyer, that’s a red flag. Are they just throwing in an offer to see what happens? This does not give the listing agent and the seller confidence that this is a solid offer or serious buyer. A real estate offer is a lengthy document with many legal terms, that can be very confusing. It’s important to sit down with your Realtor from the beginning and “de-code” what’s in the Purchase & Sale contract. There are many ways to structure a contract to make it more desirable to the Seller. Little things like shortening up an inspection time (the default is 10 days). In reality, a listing agent wants to see this shortened up considerably. There are things in a offer that can move your offer to the bottom of the pile too. It’s important to understand what these are too. These are all things that an agent learns over time, so a savvy Realtor can help you craft a winning offer with competitive terms & conditions. The highest price offer does not always win. Cash is not always king. We always come from “win-win” regarding negotiations. It’s not like it is on TV when agents are ruthless and bullying their way through a negotiation. The best negotiation comes when all parties can put themselves in the shoes of the other party. What makes sense for the buyer & the seller. We recently saw a deal where everything was going great, then during the inspection a huge plumbing issue was discovered. The seller wasn’t willing to take any money off the price and the buyer wasn’t willing to buy a home that needed a huge plumbing repair addressed. The deal fell through. This could have been avoided if both parties were willing to meet in the middle or get creative in figuring out a way to satisfy the issue.